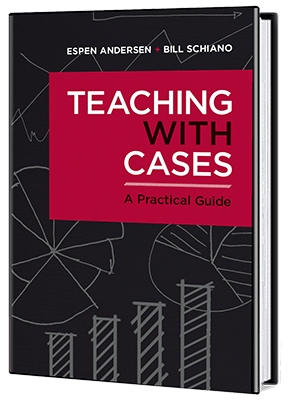 Case teaching is not just for the classroom – increasingly, you can (and some schools do) offer discussion-based (or, at least, interaction-courses online.) My buddy Bill Schiano and I wrote a long note on how to do this for Harvard Business Publishing back in 2017 – and I then completely forgot about it. Incidentally – should you (as a school) consider doing courses this way, beware that this is not a cost reduction strategy. You probably will need to pay the online teachers more than those doing regular classrooms, simply because it is more work and quite a bit more design, at least in the beginning. But it may be an excellent way of reaching student groups you otherwise could not reach, for geographical or timing reasons. This entry was posted in Case teaching, Digitalization on January 21, 2019 by Espen. I teach a M.Sc. class called “business development and innovation management”, and challenge students to write Harvard-style cases about real companies experiencing issues within these areas. The results are always fun and provide learning opportunities for the students: You may not provide the answer for the company, but you get a chance to really learn about one company or one industry and dive into the complexities and intricacies of their situation. That knowledge, in itself is valuable when you are hitting the job market. Al in all, a fairly diverse set of papers – I am looking forward to reading them. This entry was posted in Digitalization, Teaching on November 26, 2018 by Espen. Together with Chandler Johnson and Alessandra Luzzi, I currently teach a course called Analytics for Strategic Management. In this course (now in its third iteration), executive students work on real projects for real companies, applying various forms of machine learning (big data, analytics, whatever you want to call it) to business problems. We have just finished the second of five modules, and the projects are now defined. All in all, a fairly typical set of examples of the use of machine learning and analytics in business – and I certainly like to work with practical examples with very clearly defined benefits. Over the next three modules (to be finished in the Spring) we will take these projects closer to fruition, some to a stage of a completed proposal, some probably all the way to a finished model and perhaps even an implementation. This entry was posted in Analytics, Analytics for Strategic Management, Big Data, Digitalization, Teaching on October 27, 2018 by Espen. Trust is fundamental – and we trust engineering because of licensing and certification. This is not true of software systems – and that leads us to software engineering. Checks and balances important – Hammurabi code of buildings, for instance. First licensed engineer was Charles Bellamy, in Wyoming, in 1907, largely because of former failures of bridges, boilers, dams, etc. Systems engineering dates back to Bell labs, early 1940s, during WWII. In some states you can declare yourself a software engineer, in others licensing is required, perhaps because the industry is young. Computers were, in the beginning, human (mostly women). Stibitz coined digital around 1942, Tukey coined software in 1952. 1968-69 conference on software engineering coined the term, but CACM letter by Anthony Oettinger used the term in 1966, but the term was used before that (“systems software engineering”), most probably originated by Margaret Hamilton in 1963, working for Draper Labs. Programming – art or science? Hopper, Dijkstra, Knuth, sees them as practical art, art, etc. Parnas distinguished between computer science and software engineering. Booch sees it as dealing with forces that are apparent when designing and building software systems. Good engineering based on discovery, invention, and implementation – and this has been the pattern of software engineering – dance between science and implementation. Lovelace first programmer, algorithmic development. Boole and boolean algebra, implementing raw logic as “laws of thought”. First computers were low cost assistants to astronomers, establishing rigorous processes for acting on data (Annie Cannon, Henrietta Leavitt.) Scaling of problems and automation towards the end of the 1800s – rows of (human) computers in a pipeline architecture. The Gilbreths created process charts (1921). Edith Clarke (1921) wrote about the process of programming. Mechanisation with punch cards (Gertrude Blanch, human computing, 1938; J Presper Eckert on punch car methods (1940), first methodology with pattern languages. Digital methods coming – Stibitz, Von Neumann, Aitken, Goldstein, Grace Hopper with machine-independent programming in 1952, devising languages and independent algorithms. Colossus and Turing, Tommy Flowers on programmable computation, Dotthy du Boisson with workflow (primary operator of Colossus), Konrad Zuse on high order languages, first general purpose stored programs computer. ENIAC with plugboard programming, dominated by women, (Antonelli, Snyder, Spence, Teitelbaum, Wescoff). Towards the end of the war: Kilburn real-time (1948), Wilson and Gill subroutines (1949), Eckert and Mauchly with software as a thing of itself (1949). John Bacchus with imperative programming (Fortran, 1946), Goldstein and von Neumann flowcharts (1947). Commercial computers – Leo for a tea company in England. John Pinkerton creating operating system, Hoper with ALGOL and COBOL, reuse (Bener, Sammet). SAGE system important, command and control – Jay Forrester and Whirlwind 1951, Bob Evans (Sage, 1957), Strachey time sharing 1959, St Johnson with the first programming services company (1959). Software crisis – not enough programmers around, machines more expensive than the humans, priesthood of programming, carry programs over and get results, batch. Fred Brooks on project management (1964), Constantin on modular programming (1968), Dijkstra on structured programming (1969). Formal systems (Hoare and Floyd) and provable programs; object orientation (Dahl and Nygaard, 1967). Main programming problem was complexity and productivity, hence software engineering (Margaret Hamilton) arguing that process should be managed. Royce and the waterfall method (1970), Wirth on stepwise refinement, Parnas on information hiding, Liskov on abstract data types, Chen on entity-relationship modelling. First SW engineering methods: Ross, Constantine, Yourdon, Jackson, Demarco. Fagin on software inspection, Backus on functional programming, Lamport on distributed computing. Microcomputers made computing cheap – second generation of SW engineering: UML (Booch 1986), Rumbaugh, Jacobsen on use cases, standardization on UML in 1997, open source. Mellor, Yourdon, Worfs-Brock, Coad, Boehm, Basils, Cox, Mills, Humphrey (CMM), James Martin and John Zachman from the business side. Software engineering becomes a discipline with associations. Don Knuth (literate programming), Stallman on free software, Cooper on visual programming (visual basic). Arpanet and Internet changed things again: Sutherland and SCRUM, Beck on eXtreme prorgamming, Fowler and refactoring, Royce on Rational Unified Process. Software architecture (Kruchten etc. ), Reed Hastings (configuration management), Raymond on open source, Kaznik on outsourcing (first major contract between GE and India). Mobile devices changed things again – Torvalds and git, Coplien and organiational patterns, Wing and computational thinking, Spolsky and stackoverflow, Robert Martin and clean code (2008). Consolidation into cloud: Shafer and Debois on devops (2008), context becoming important. Brad Cox and componentized structures, service-oriented architectures and APIs, Jeff Dean and platform computing, Jeff Bezos. And here we are today: Ambient computing, systems are everywhere and surround us. Software-intensive systems are used all the time, trusted, and there we are. Computer science focused on physics and algorithms, software engineering on process, architecture, economics, organisation, HCI. SWEBOK first 2004, latest 2014, codification. Scale is important – risk and cost increases with size. Most SW development is like engineering a city, you have to change things in the presence of things that you can’t change and cannot change. AI changes things again – symbolic approaches and connectionist approaches, such as Deepmind. Still a lot we don’t know what to do – such as architecture for AI, little rigorous specification and testing. Orchestration of AI will change how we look at systems, teaching systems rather than programming them. Fundamentals always apply: Abstraction, separation, responsibilities, simplicity. Process is iterative, incremental, continuous releases. Future: Orchestrating, architecture, edge/cloud, scale in the presence of untrusted components, dealing with the general product. “Software is the invisible writing that whispers the stories of possibility to our hardware…” Software engineering allows us to build systems that are trusted. This entry was posted in Academically speaking, Digitalization, Nerdy ruminations, Technology strategy, The thoughtful manager and tagged #ACMlearning, ACM, software engineering on April 25, 2018 by Espen. This entry was posted in Academically speaking, Big Data, Digital reflections, Digitalization, Nerdy ruminations, Technology strategy, The thoughtful manager on October 18, 2017 by Espen. Decisions from Data is aimed at managers who are curious about Big Data and data science and wants an introduction and an overview, without having to take a full course. We will talk about and show various forms of data analysis, discuss the most important obstacles to becoming a data driven organization and how to deal with data scientists, and, of course, give lots of examples of how to compete with analytics. The course will not be tech heavy, but we will look at and touch a few tools, just to get an idea of what we are asking those data scientists to do. Welcome to the data revolution – it start’s here! This entry was posted in Academically speaking, Analytics, Analytics for Strategic Management, Digitalization, The thoughtful manager on October 4, 2017 by Espen. If you are a public transportation company: How do you tell your prospective passengers that their travel plans may have to change? Public transportation companies know a lot about their passengers’ travel patterns, but not as much as you would think – and, surprisingly, they know less now when ticket sales have been automated than they used to know before. Let’s take a concrete company as an example: Ruter AS, the public transportation authority of Greater Oslo. Ruter is a publicly owned company that coordinates various suppliers of transportation services (bus, tram, train, some ferries) in the Oslo area. The company has been quite innovative in their use of apps, selling most of their tickets on the RuterBillett app, and having many of their customers plan their journey on the RuterReise app. The apps are very popular because they make it very easy both to figure out which bus or train to take, and to buy a ticket. The company has a problem, though: While they know that someone bought a ticket on the ticketing app, they don’t know which particular bus, tram or other service the passenger took (a ticket typically gives you one hour of open travel on their services, no matter how many of them you use). They could get some information from what people have been searching for, but the two apps are not linked, and they don’t know whether a passenger who searched for a particular route actually bought a ticket and did the journey – or not. There are many reasons for this lack of knowledge, but privacy issues – Norway has very strict laws on privacy – are important. Ruter does not want to track where its customers are travelling, at least not if it in any way involves identifying who a passenger actually is. Not knowing where passengers are is a problem in many situations: It creates difficulties for dimensioning capacity, and it makes it difficult to communicate with passengers when something happens – such as a bus delay or cancellation. The problem for Ruter is that they want to know where people are travelling (so they can figure out how many buses or trams they need to schedule), they ned to know who regularly takes certain journeys (so they know whom to send a message to if that route is not working) and they need to know who is in a certain area at a certain time (so they don’t send you a message about your bus being delayed if you are out of town, for instance). All of this is easy, except for one thing: Norway has very strict privacy laws – already quite similar to EU’s General Data Protection Regulation, which goes into effect in 2018 – and Ruter cares deeply about not being seen as a company that monitors where people travel. In short, they need to know where you travel, but do not want to know who you are. This is a seemingly impossible challenge, but Smarthelp Secure Infrastructure, in combination with Smart Decision Support, makes it possible. The communications platform creates an end-to-end encrypted communication channel between a central system and the smartphone. Using technology developed because we had to solve the problem of medical-level encrypted communication between emergency centers and individual users, Smarthelp has technology that allows someone to track specific information you allow access to – say, the fact that you are in a certain area, or that you regularly travel certain paths – without sharing other information, such as your name. This would allow Ruter, when something happens, to send a message to people who a) regularly takes, say, bus route 85, and who b) is in an area where it is conceivable that they could take the bus, given their prior patterns, the time of day, and so on. For the individual passenger, this would mean that you only get pertinent messages – you don’t get messages about bus routes you don’t normally take (unless you actually get on the bus), and you don’t get messages when you are far enough from the bus that it is clear you are not going to take it anyway. In a world of information overload, this is extremely important – flood the user with many messages, and they do not read them. The next step in public transportation is that the users tells the company not just that they want to get on the bus, but also where they want to go. I have been told that in an experiment, Telenor found that, one sunny summer afternoon, fully half of their employees (located at Fornebu outside Oslo) planned to go to Huk, a public beach on Bygdøy. The distance from Telenor’s headquarters at Fornebu is 10 minutes by car, but takes more than 30 minutes by public transportation, involving two bus routes. If Ruter had known about these travel plans, though, it could have just rolled up some buses and driven the employees directly, vastly improving the service – and avoiding clogging up the regular buses to Bygdøy. And that is the future of public transportation: Instead of planning where you will go in terms of geography, you will tell the public transportation company where you want to go, and they will get you there. With self-driving cars, they will be able to tell you when you will be at your destination – but, perhaps, not willing to tell you the actual route. As a passenger, you probably will not care – after all, what matters to you is when you arrive, not by which route. That would, in effect, mean that we have transitioned public transportation from line switching to packet switching, effectively turning the bus into the Internet. But that is for the future. In the meantime, there is Smarthelp. Smarthelp is a platform technology consisting of, at present, three elements: Smarthelp Rescue, an app for iPhone and Android that allows users to transmit their position to an emergency service; Smarthelp Decision Support, a decision support system which allows an operator to locate and communicate with users (both with the app and without), and Smarthelp Secure Infrastructure, a granularly encrypted communications platform for secure, private communication. If you want more information, please contact me or Fredrik Øvergård, CEO of SmartHelp. This entry was posted in Digitalization, Entrepreneurship, SmartHelp on June 1, 2017 by Espen.